Here are my thoughts on a few Christmas specials Beth and I watched this month, not counting ones I’ve already written about. Frosty’s Winter Wonderland – I vaguely remember seeing this years ago on a black and white TV, when I must have been five or younger. Coming out seven years after the original Frosty special, when Jimmy Durante was no longer acting, this was narrated by Andy Griffith instead. Now living at the North Pole, where he has a house but apparently no close friends (Santa Claus is presumably too busy), Frosty goes back to the town where he was made. Finding out how lonely he is, the kids make him a wife, whom they name Crystal; and she comes to life when Frosty gives her a bouquet. Not only that, but the kids also make a snow parson to perform the marriage ceremony, and he comes to life when he holds the Bible. Is that religious magic in a generally secular Christmas show? I think it’s mostly just to reference “Winter Wonderland,” and in light of what I wrote about the song yesterday, the cartoon has both a real Parson Brown and a snow version. But really, doesn’t this ruin Frosty’s uniqueness? Although this takes place in the same town, Karen isn’t in it, and she was the main kid in the first one. Neither do Professor Hinkle or Hocus Pocus the rabbit, although I guess there’s not any particular reason they’d still be hanging around there. And no, Virginia, there’s no Santa Claus in it either. You know who does return? The kid who wanted to call Frosty Oatmeal (he suggests the name Cornflakes for Crystal) and the traffic cop who swallowed his whistle. The main villain is Jack Frost, who’s irritated because no one pays attention to him, until Crystal is nice to him and he agrees to be Frosty’s best man. And that’s pretty much it. Not that memorable, but I’m still not sure why it doesn’t seem to be rerun as much as other Rankin/Bass specials. Dean Martin Christmas Show – I believe this one was from 1968. It’s the sort of corny holiday variety show a lot of celebrities did back in the day, with comedy segments featuring Bob Newhart and Dom DeLuise, as well as bunch of other celebrities who appear briefly to announce orphanages to which the show is sending toys. Because what better way to promote children’s welfare than with a lot of jokes about drunkenness? Raggedy Ann and Andy in the Great Santa Claus Caper – We watched a Raggedy Ann Halloween special a few years ago, and this is much the same. It’s very low-budget and mawkish, but does boast Chuck Jones as director, and Daws Butler and June Foray as voice actors. 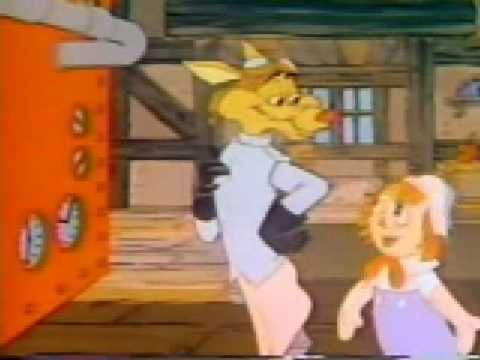 The plot, such as it is, has a wolf who’s an inventor and profiteer, and looks and sounds a lot like Wile E. Coyote, especially in the cartoons where he talked. He’s also said to be the same Big Bad Wolf from the Three Little Pigs and Little Red Riding Hood, but that’s only briefly mentioned. His plot is to take over Santa’s workshop and coat everything in an unbreakable substance he invented called Gloopstik, then sell the toys to kids. He’s able to do this because Santa dismisses the elves and then goes to sleep, not even bothering to have a night watchman. Comet the reindeer overhears his plan and recruits the Raggedys, who manage to trap the wolf in his own substance. There’s a message of how toys would last longer that way, but they’re not much good if kids can’t play with them. Was collecting toys and not taking them out of the packages a thing back then? This was from 1978, so Star Wars toys presumably weren’t worth anything yet. Anyway, it turns out that Gloopstik can be destroyed with love, because that’s the kind of show this is, and the dolls call on the audience to help out, explicitly mentioning the similarity to bringing back Tinker Bell. Oddly, the voices they use for the audience don’t sound much like children. The wolf also agrees to reform and is set free. And when they show Santa riding in his sleigh, he whips the reindeer, even though they seem to be sentient beings. Overly lax security AND animal abuse, St. Nick? 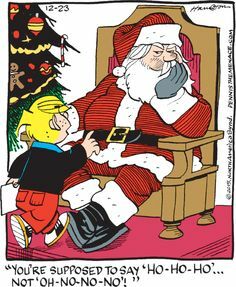 Dennis the Menace: The Christmas Horse – This was just a Christmas episode of the old Jay North show, where Dennis really wants a horse for Christmas. When he doesn’t get one, he assumes Santa must have brought it somewhere else, because apparently Santa doesn’t have the option of refusing. Another kid in his neighborhood actually does get a horse, and doesn’t want it. Dennis tries to trade for it, but that plan is nipped in the bud. Instead, an old guy who sells Christmas trees makes an arrangement where Dennis can consider himself the owner of his old horse, but he’d still keep it on his farm and take care of it. It’s kind of a clever resolution, but I think Dennis could benefit from just being flat-out told no occasionally. It’s not like Dennis is even particularly menacing, just kind of entitled. And isn’t it weird that a little kid wants to spend his time hanging out with his crotchety old neighbor? I feel it worth mentioning that Margaret gets a Raggedy Ann doll in this episode; this was presumably before the doll saved Christmas from that wolf. This entry was posted in Cartoons, Christmas, Comics, Fairy Tales, Holidays, Humor, Magic, Music, Television, Toys and tagged andy griffith, big bad wolf, bob newhart, chuck jones, comet, daws butler, dean martin, dennis the menace, dom deluise, frosty the snowman, frosty's winter wonderland, jack frost, jay north, jimmy durante, june foray, parson brown, raggedy andy, raggedy ann, rankin-bass, reindeer, santa claus, the great santa claus caper, variety shows, winter wonderland. Bookmark the permalink.